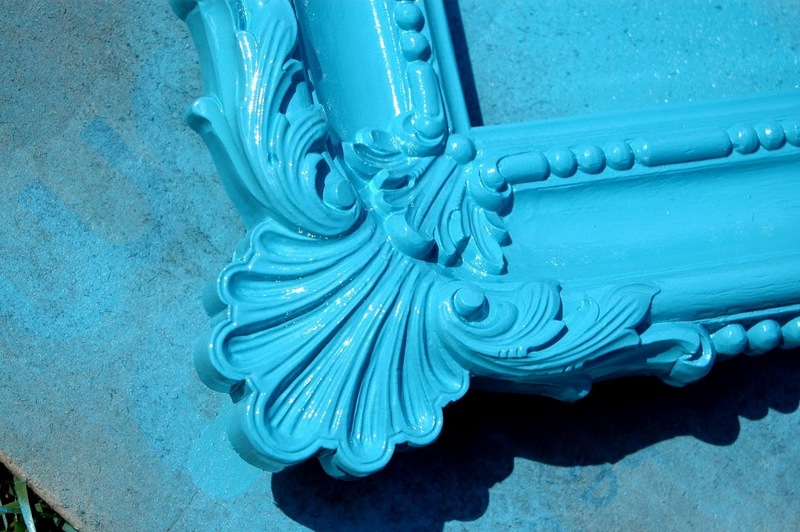 A little glossy turquoise spray paint please. 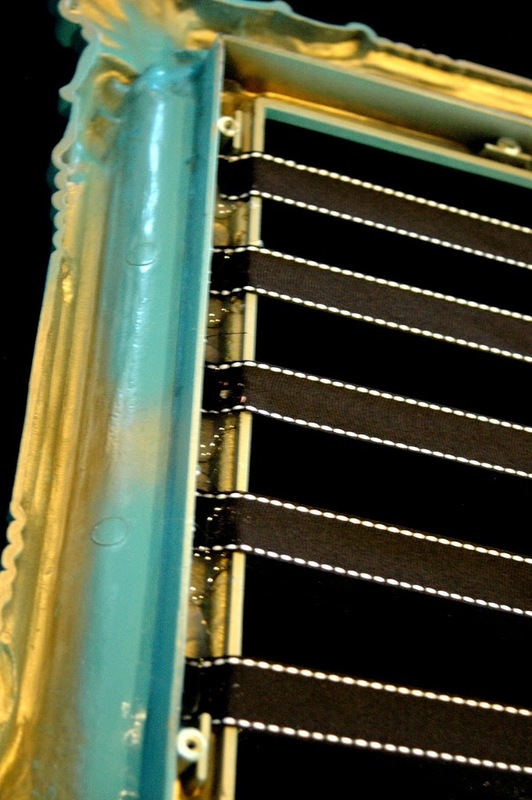 Oh my goodness, I love those details. 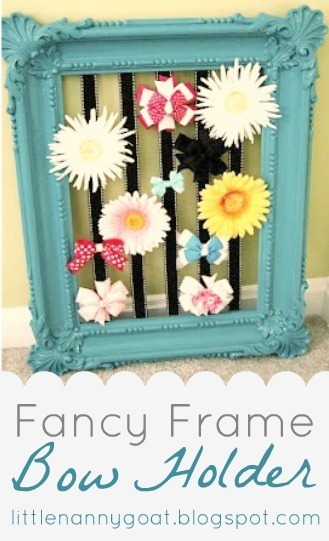 Okay, this frame would look fabulous on anything but I have something particular in mind. 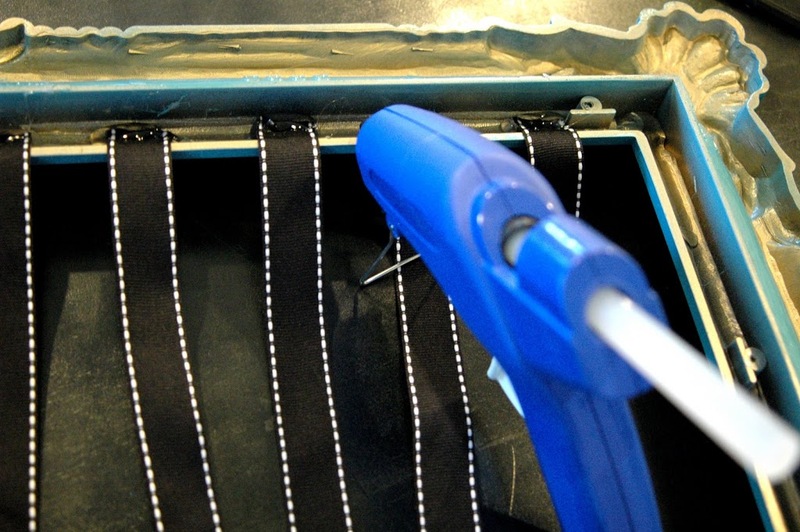 Flip the frame over and measure ribbon to stretch from top to bottom with a little extra and hot glue (I’d use a staple gun if your frame is made of wood) the ribbon, evenly spaced (mine are about 2 inches apart) to the top. Seriously, so easy my friends. WA LA, you have a “funky bow holder thingy”. It’s like art with a purpose… I love multi-tasking! 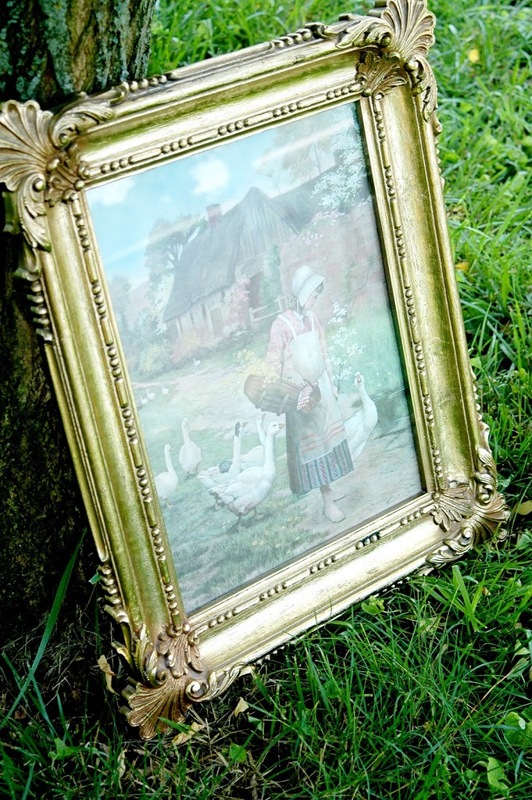 Oh my goodness, I’m off to Goodwill, I need another funky frame quick! PS Thanks for letting me come and visit U Create, Kari! 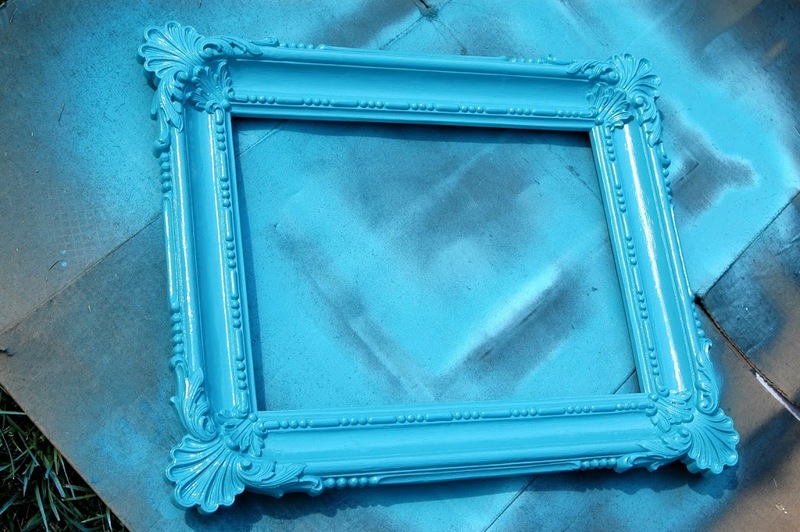 The frame looks fabulous in turquoise! Where do you find that color spray paint? So cute!! I don’t have any little girls of my own, but I’ll make and give as gifts to the friends of mine who do. Wonderful and easy idea! Thanks for sharing! You read my mind because this is my next project! love it! LOVE, love, love this!! I’m off to Estate Sales & Goodwill to treasure hunt today! So Cute. I love the frame and the color! Love it, very chic!!! These would be great gifts for all my nieces!! Thanks for the idea!! What a cute idea!! LoVe the color! Really cute! My sister and I made something very similar – but hot glued fabric to the old backing of the frame! They turned out so cute! I am for sure gonna check out Nannygoat! Kathryn! This is perfection! Thanks again for a fabulous tutorial! The frame makes it. That is so cool! I am adding this to my to do list except I think I have a few years till we can put a bow in my little baldy hair. This is sooo awesome! Im so doing this one! This is such an awesome idea! I love organizing, especially when it also looks cute! I am in absolute LOVE with this project! I’m going to do this immediately! Without delay! I LOVE this idea! And yours looks so cute. I’m putting it on my inspiration blog to use if I ever have a girl someday! Thanks for sharing!! I NEED to know where you found that color of spray paint!!! I’ve been searching high and low for that exact color for a chair!! Could you please let me know where you got it? There’s a link to my email in my profile. Thanks so much!! Oh, and adorable project by the way!! I thought I was so clever when I ‘thought’ of this idea a few days ago. I’ve been to every second hand/dollar store in the valley looking for awful frames. It looks fantastic. I love the chalkboard, too. How funny! I just did this a few weeks ago. I have boys, so I bought a frame from the DI and put ribbon on it to hold their church ties. Very cool. That is fine tutorial. But i will apply it my friend next week. And i will see what happen next. Its very wonderful and easy idea. LOVE this! thanks so much for sharing, i will definitely be making this one!! I made one of these and I love it! Thank you! 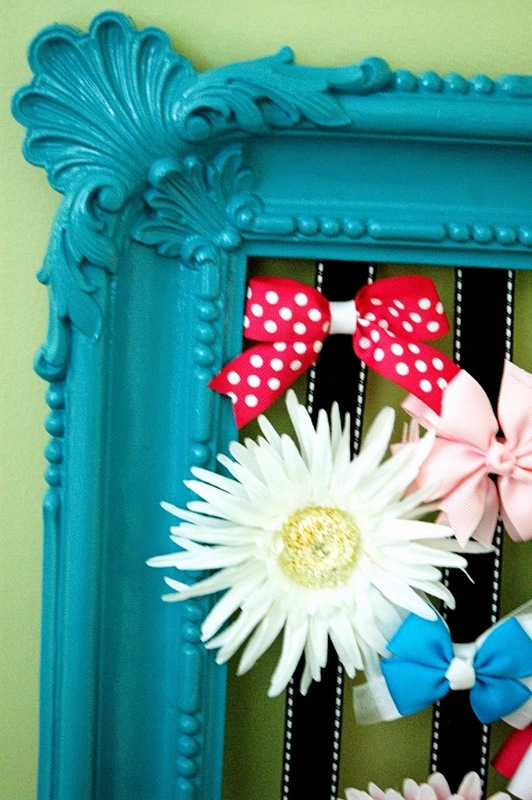 I saw this blog post a few months ago when looking for a creative DIY bow holder for my princess. 🙂 Since then, I have been on the lookout for a funky frame, and *finally* I found it yesterday. I swung by Walmart to get some seafoam colored spray paint and ribbon, and hurried home. I found this page again to get a fresh look at the spacing of the ribbon, and lo and behold, I BOUGHT THE EAXCT SAME FRAME/PIC!!!! I laughed so hard to see your lady with the ducks looking just like mine! $5 wells spent! I’m planning to experiment with different colored ribbons. Hope it turns out as cute as yours! Thanks for the idea!!! 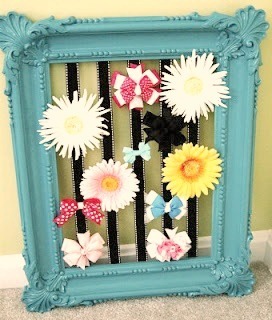 I gotta say I just found this picture on Pinterest and thought the frame looked just like the one I bought today! Yup!! Same picture of the farm girl! I painted my frame white and painted the glass with chalk board paint! Its drying right now. Too funny! Great frame! How is yours holding up….I was alittle concerned spray painting it since it is plastic and I didnt use plastic spray paint. So glad I found this page! I have big bows as well as teeny tiny infant hair clips that wont clip onto wider ribbons. With this project, I customized using both wide and narrow ribbon. It turned out absolutely perfect. Thank you! Breast Enlargement Financing – Go In For A Makeover Now!